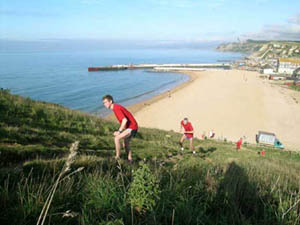 On a hot Saturday (4th September) 4 teams set off from Lyme Regis at 8.00a.m. 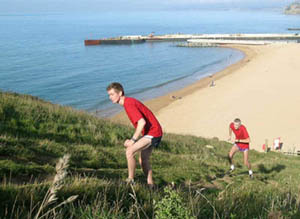 to tackle the annual Coast Path Relay Challenge. 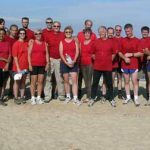 This involves running the whole length of the Dorset Coast Path using the Inland route via Hardy’s Monument and finishing at Studland Ferry. The distance is around 65 miles and involves over 2300 metres of climb. This year KERNO (the victors from 2003) Wessex, Wimborne and the South West Squad fielded teams to compete in this gruelling yet highly enjoyable contest. 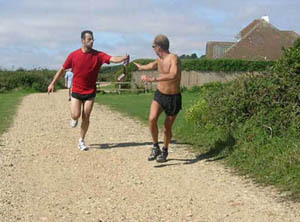 Rather like the Olympics it is the taking part which is as important as winning. However, that didn’t stop us giving our all in an attempt to topple KERNO off their winning slot. With a team which totalled 30 at one time or another we were still ten runners behind KERNO in numbers but hoped that our new strategy and improvements over last year’s organisation would overcome the shortage in numbers. At Lyme we had several runners to take the baton (we use a sash) up the steep hill but were surprised that KERNO and Wimborne were already marginally ahead of us. However by the time we got to Seatown we had overtaken Wimborne and were only 80 seconds behind KERNO. This battle continued through West Bay, West Bexington and on to Hardy’s Monument. 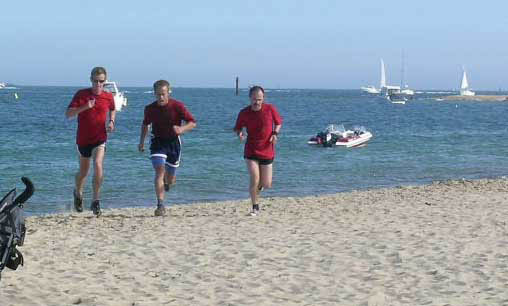 By the time we reached there we were well ahead of Wimborne and didn’t see them or the South West Squad again that day. At each change over point our outgoing runners were usually waiting when the KERNO runner went though and the time difference varied between 6 and 9 minutes most of the afternoon. Despite losing our Chairman at one of the change overs (don’t worry, Wimborne very kindly picked her up and returned her after demanding a ransom) the organisation generally held together very well. There were some tight times to get from one change over point to the next but most of these were achieved. 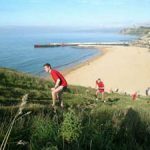 By the time we reached Durlston Country Park outside Swanage we hade been running for nearly 7 hours and the heat and tiredness were taking their toll. Also running short sharp uphill sections and then getting back in the car to drive elsewhere meant that legs were starting to cramp up. However we maintained the momentum and finished in grand style at the ferry in a new record time for Wessex of 7 hours 49 minutes 50 seconds. This beats last year’s record time by an incredible 46 minutes. KERNO managed to better their last year’s time with a new record for the course of 7 hours 24 minutes, a target for us for next year. A barbecue at Cogdean Close finished off a very tiring and enjoyable day with a great team spirit from all the Wessex participants. 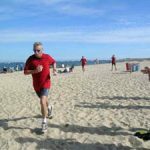 A debriefing was held at the September Club Night and already plans for next year are being talked about and improvements suggested to increase our speed. Watch this space for Cunning Plan Mark Two. P.S. Why the Red Brigade? 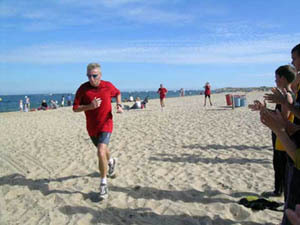 We all wore Red T-Shirts so that we could see the incoming runner from a long distance away, and it worked very well.